Hi loves! I just got back from SHINZU'I UME BODY MIST event and I decided to write about it right away because of how lovely the event was. The event started early in the morning around 9AM and ended around 3PM. I know, it's quite long eh? But it didn't feel long at all because I was so happy to be able to meet with new faces as well as some old friends. The event was held to announce Shinzu'i Ume latest product which is Ume Body Mist and is located at 3 Wise Monkeys which is a Japanese restaurant, they serve good quality of salmons! A representative from Shinzu'i started the event by introducing Shinzui Ume Body Mist to us, explaining every details about the variants and its ingredients. After that my friend Miharu Julie, a beauty blogger did a talkshow about how to be a beauty blogger/vlogger and what to do to keep good contents. The talkshow was very inspiring and it makes me want to work harder as a blogger! Ume Body Mist is inspired from the country of kawaii and uniqueness. Can you guess from where? Yup it is inspired from Japan! The shape of Ume Body Mist is inspired from the shape of Japanese Kokeshi doll. Kokeshi are Japanese dolls that originated from northern Japan. They are handmade from wood and has a floral design painted on the body. One characteristic of kokeshi dolls is their lack of arms or legs. Shinzu'i Ume Body Mist has a strong resemblance to this Kokeshi Dolls and is so cute that makes it desirable to be collected and displayed. I really want to buy and collect each of the perfumes, like seriously who can resist? 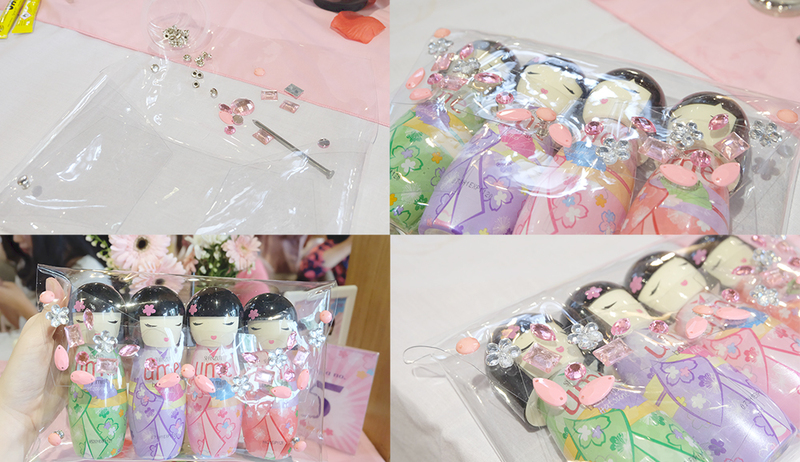 At the end of the event we did a workshop where we were taught on how to make a transparent clutch! The workshop was a big hit, everyone enjoyed making their own personalised clutch. I myself has drown into the world of decorating that I didn't see that the time is up for the workshop. And to my surprise, all 4 variants of Ume Body Mist fit into this small transparent clutch! The size of Shinzu'i Ume Body Mist is also travel-able, it is small but not small enough to be called travel size. Its size is perfect to bring inside your bag or even clutch. Since the packaging is made from wood and plastic, it is superbly sturdy and won't be wrecked when it falls so don't worry! I know how heartbreaking it is if a perfume fell and broke into tiny piece of glasses. The smell of Ume Body Mist will complete your day as it contents natural flower scent. These perfumes suits for Indonesian teenagers to complete their appearance every day so they can smell flowery nice and cheerful in every moment. Iseya is a typical sweet and traditional girl who loves art and craft. The fragrance of Iseya comes from floral and sweet fruit. Ingredients: citrus, bergamot, cassis, cyclamen, jasmine, ylang-ylang, sandalwood, cedarwood, and vanilla. Keiko is an elegant and flowery girl who loves ballet, volunteering, playing with her cat, and travelling. Yes, this is my favourite variant out of all Ume Body Mist. The fragrance of Keiko comes from floral and sweet which is soft and musky. Ingredients: geranium, lavandin, ylang, muguet, peony, rose, musk, and wood. Ayume is a pretty and stylish in a sporty way. A girl who loves cheerleading, beauty vlogging and team sports. The fragrance of Ayumi comes from floral and berries which is sweet and fresh. Ingredients: plum, bergamot, wild berries, sanbac jasmine, plumeria, white lily, soft woods, patchouli, amber, musk, and vanilla. Hatsune is a preppy girl who loves reading, studying and join in the science club. The fragrance of Hatsune comes from fruits which resulted a fresh scent. Ingredients: pineapple, pear, peach, apricot, rose, orchid, white flowers, freesia, musk, amber, vanilla, and sandalwood. Where can we buy Shinzu'i Ume Body Mist? Alfamart, Indomaret, Alfamidi, Carrefour Market. hallo kak, salam kenal ya.